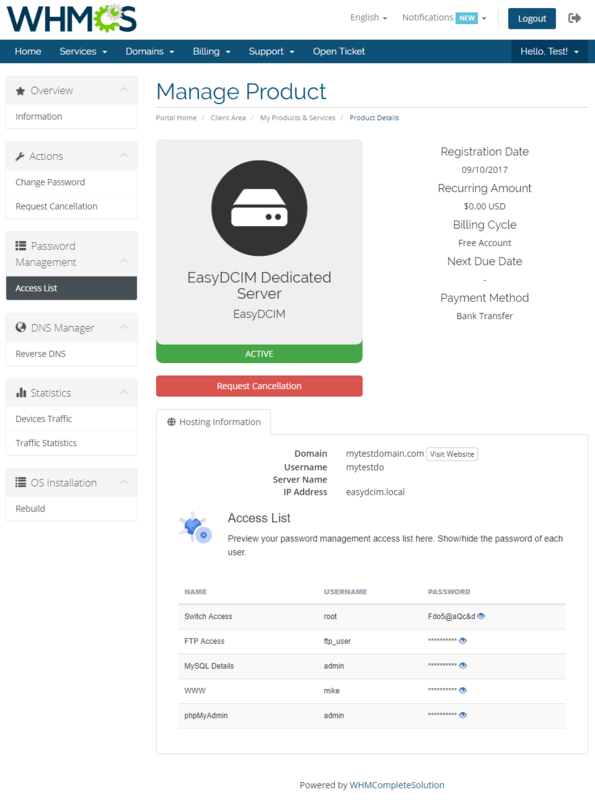 EasyDCIM Dedicated Servers For WHMCS will allow you to move the provisioning and management of EasyDCIM servers directly to your WHMCS. The module will let you handle all crucial aspects of created servers, including their status and the SSH password. Concurrently, your customers will be able to overview their servers, access KVM console, manage rDNS records and more, all without leaving your website. 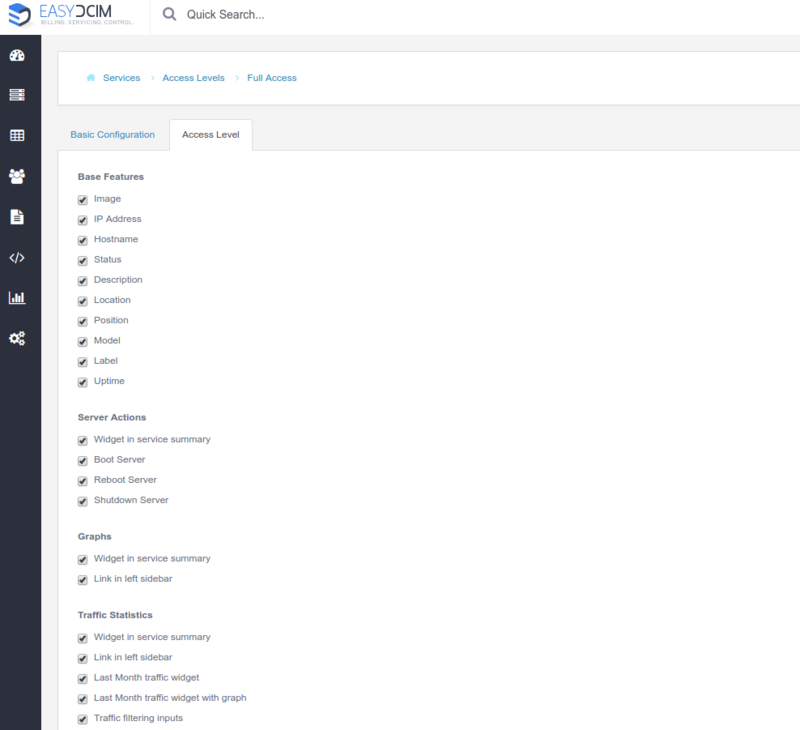 This tutorial will show you how to successfully install and configure EasyDCIM For WHMCS. 4. Next, choose 'EasyDCIM' from the 'Type' dropdown menu. Fill in your server name, IP address, username and password, then press 'Save Changes'. 5. After configuring your server, you can check the connection. In order to check the connection with an EasyDCIM server, edit the server configuration and press 'Test Connection' as shown on the screen below. 6. The next step is creating a server group. To do so, click on 'Create Server Group'. 7. 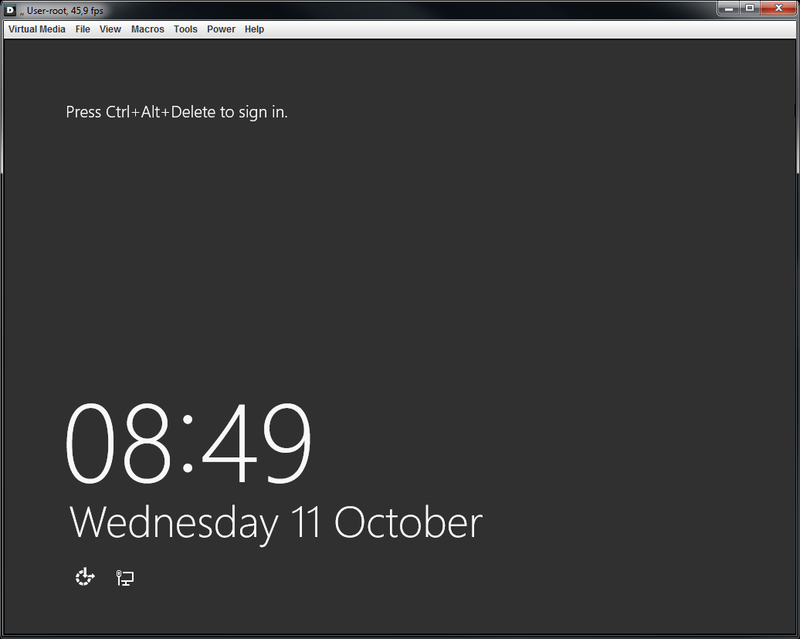 Enter the name, click on your previously created server, press 'Add' and 'Save Changes' afterwards. 9. In order to create and configure a product, go to 'Setup' → 'Products/Services' → 'Products/Services'. 10. 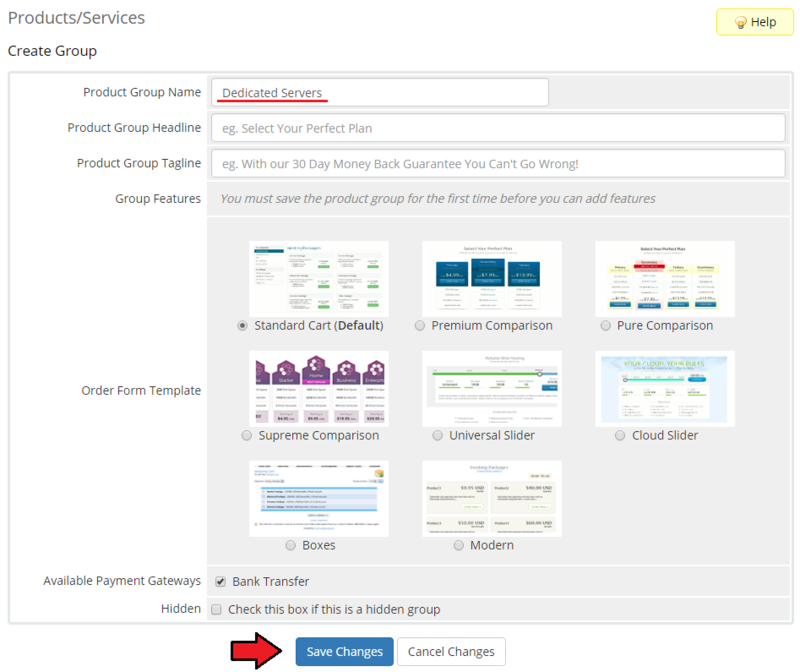 Enter the product group name and press 'Save Changes'. 11. Once you have a product group, you can assign your product to it. 12. Next, choose your product group, enter your product name and then press 'Continue'. 13. 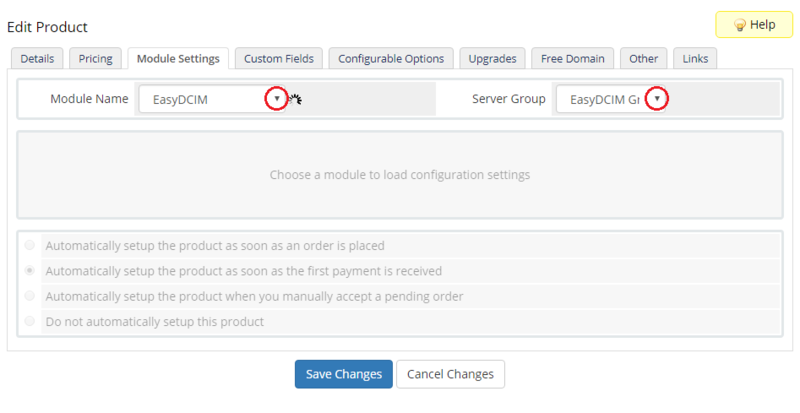 Now, go to the 'Module Settings' section, choose both 'EasyDCIM' and your previously created server group from dropdown menus. 14. 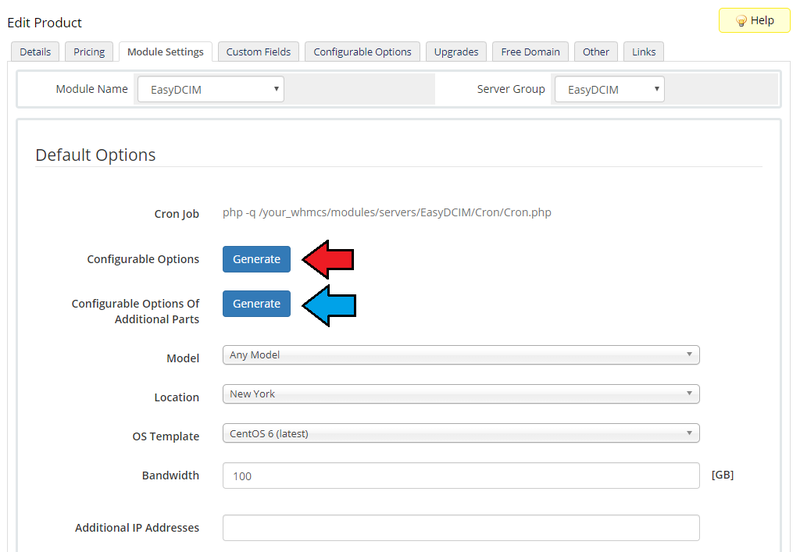 Before configuring the product, set up the EasyDCIM cron job which can be found here. 15. The module configuration is only partly obligatory. The server will be assigned based on the provided configuration, and will therefore match only those options that have been specified. Specify whether a chosen part has to be of a specific model, e.g. match the server using `Intel Xeon E3-1220 v5` CPU. Define elements available to your customers in your WHMCS client area. Choose service actions to send chosen email notifications to selected administrators instead of performing provisioning actions immediately. Leave the fields unchecked to perform WHMCS module commands in a default manner. Choose the email template that will be sent to the client when creation of the ordered server is finished. 15. 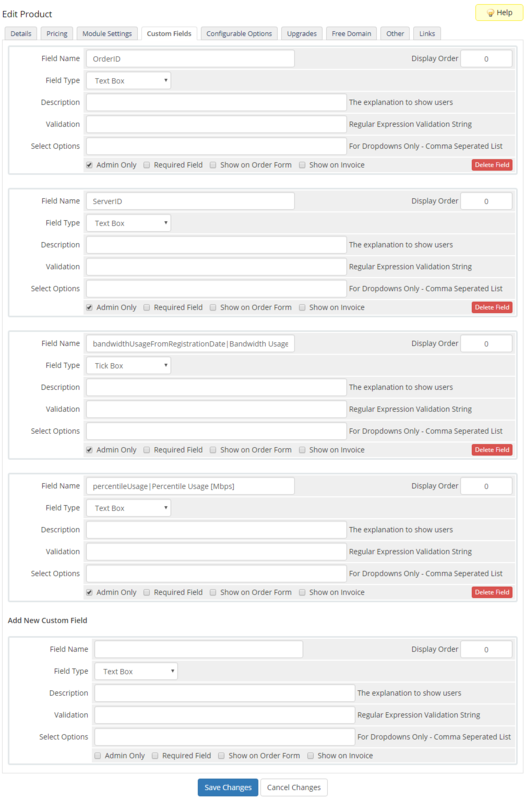 Now, you can optionally generate the default configurable options to allow placing orders tailored to your customers' needs. We recommend viewing and modifying them to fit your provisioning capabilities. You can find them under 'Setup' → 'Products/Services' → 'Configurable Options'. 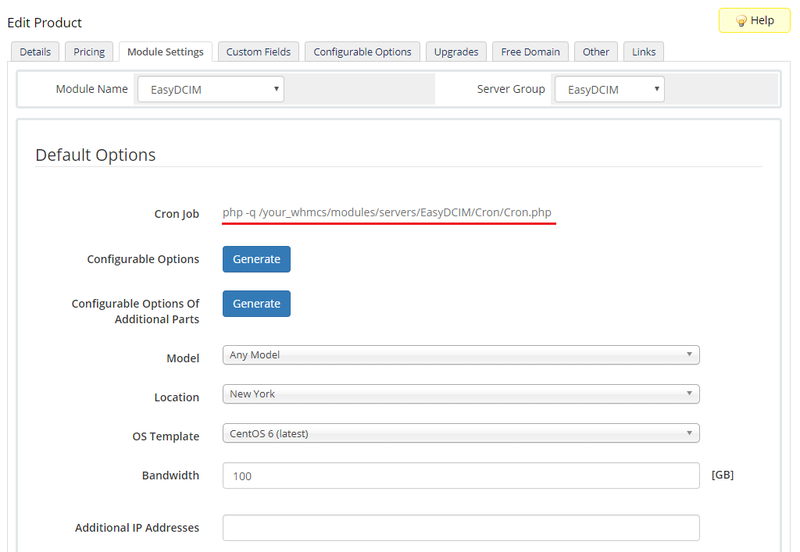 Note: You can also add your own configurable options which will be then displayed under 'Service Configuration' in your EasyDCIM backend. Important: Any configurable option will overwrite its counterpart from the 'Module Settings'of a product. 16. Additionally, you can set up a percentile billing for additional traffic. 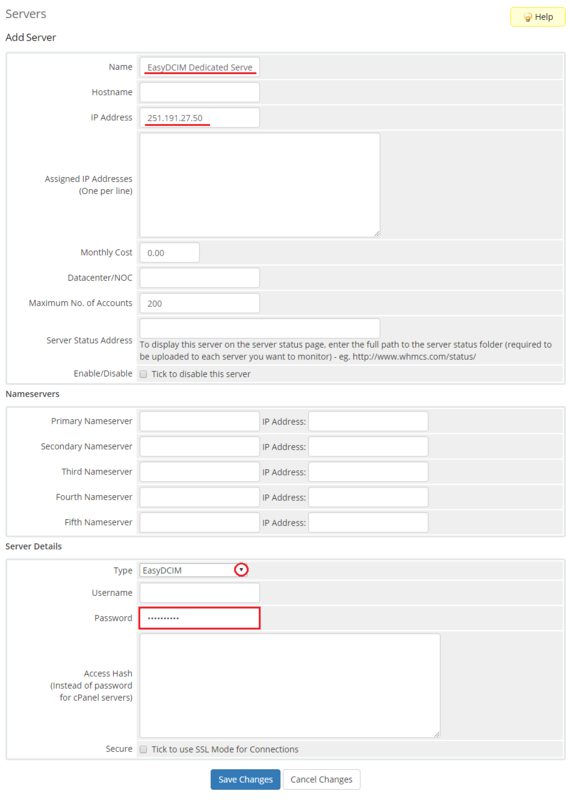 Note: This option is possible only if you do not have Advanced Billing Form WHMCS module installed. If you need a bit more advanced billing integration, please go here for more information. E.g. 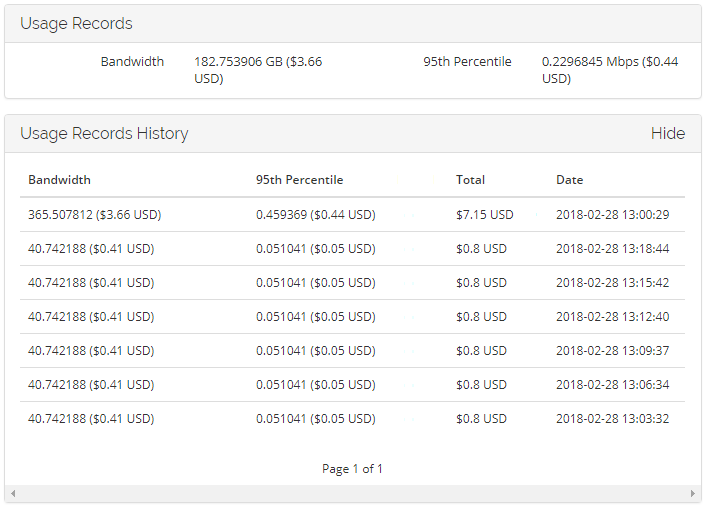 If 'Soft Limit = 100' and 'Cost = 0.500' and the client exceeds the bandwidth by 10 Mbps, reaching to '110 Mbps' , they will be additionally charged with $5 USD (10 x 0.500). Note: The percentile billing requires the standard billing of bandwidth overages to be enabled. 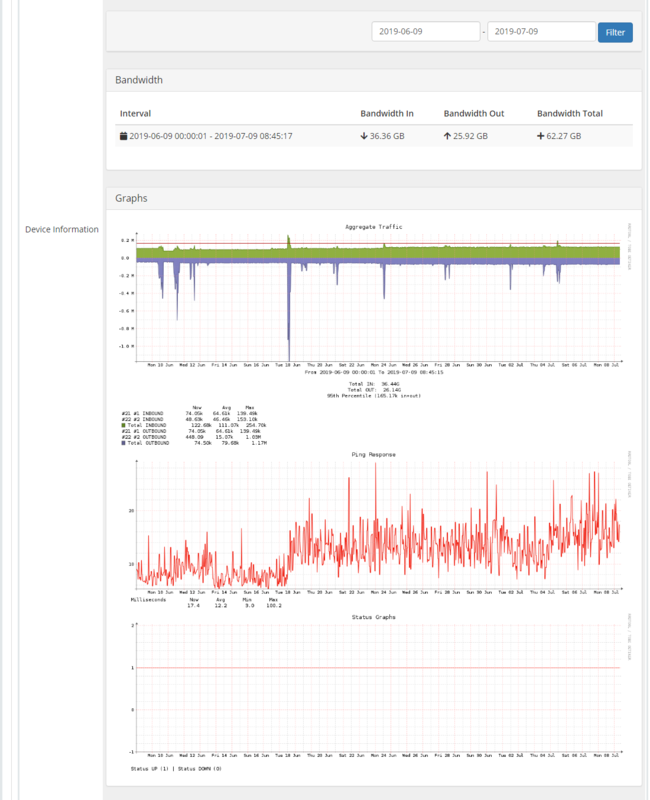 It will be also calculated during the execution of the WHMCS system cron. Note: These fields will not be visible to clients by default. 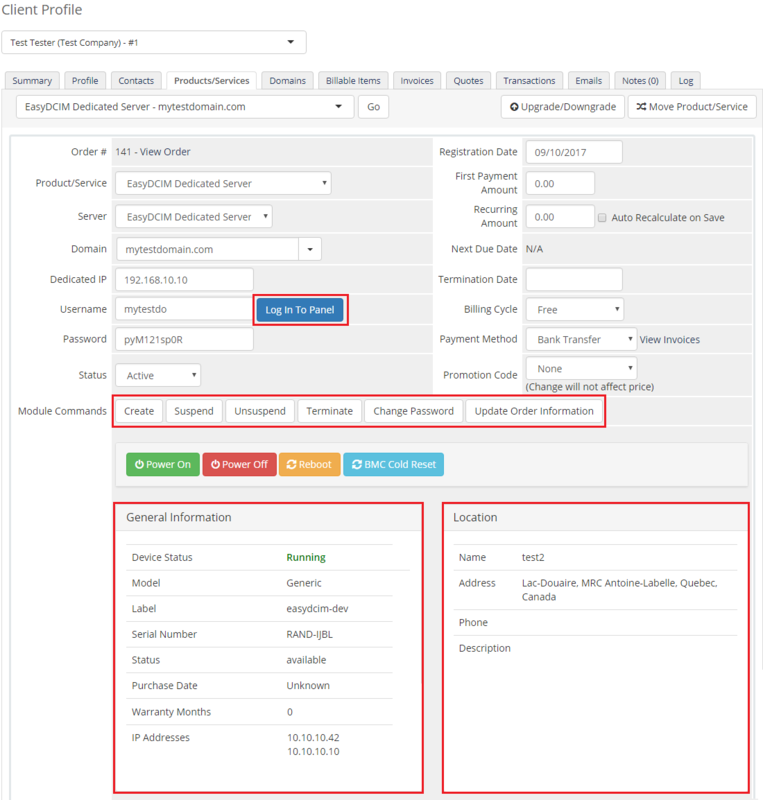 bandwidthUsageFromRegistrationDate - if set to 'on' , the billing cycle for transfer usage will be billed monthly, starting from the date of product registration (e.g. from the 15th to the 15th of the following month). 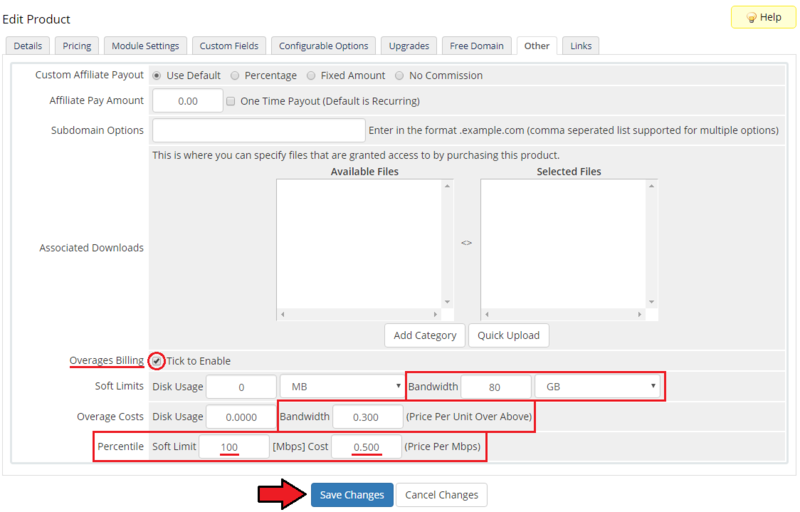 Otherwise, usage charges will be calculated on the last day of each month as in default WHMCS cycle. percentileUsage - the entire current usage. If the value specified previously in the percentile configuration is exceeded, the additional charge will be calculated accordingly. 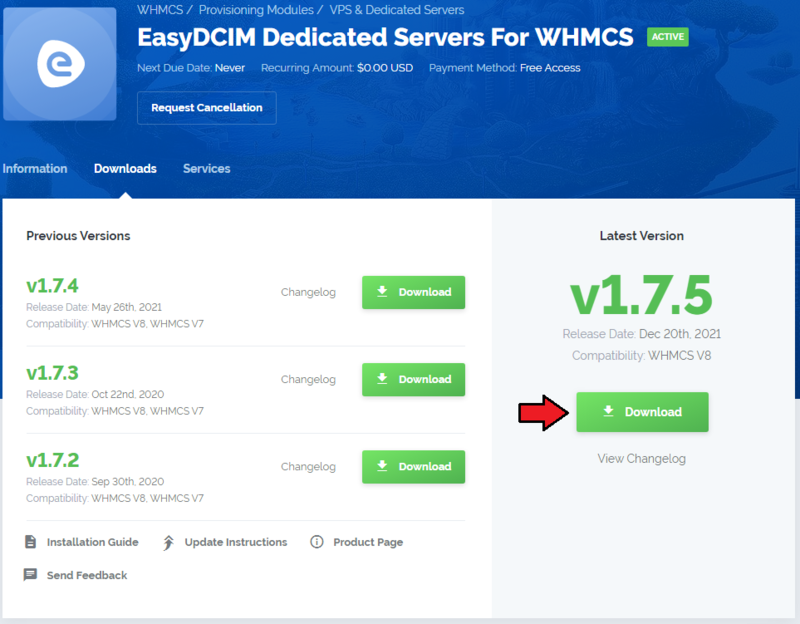 In this section we will show you all possibilities of EasyDCIM Dedicated Servers For WHMCS. 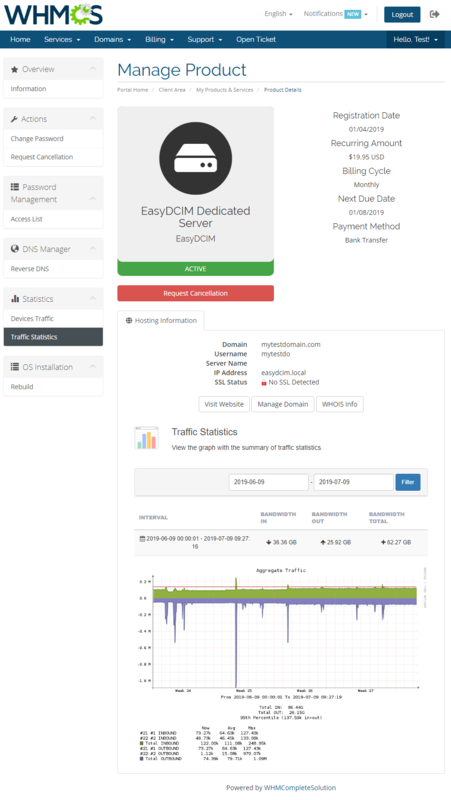 Our module allows you to offer and manage EasyDCIM servers right in your WHMCS system. As soon as you set up a server for a client, you can request various actions and view server details from the WHMCS admin area. 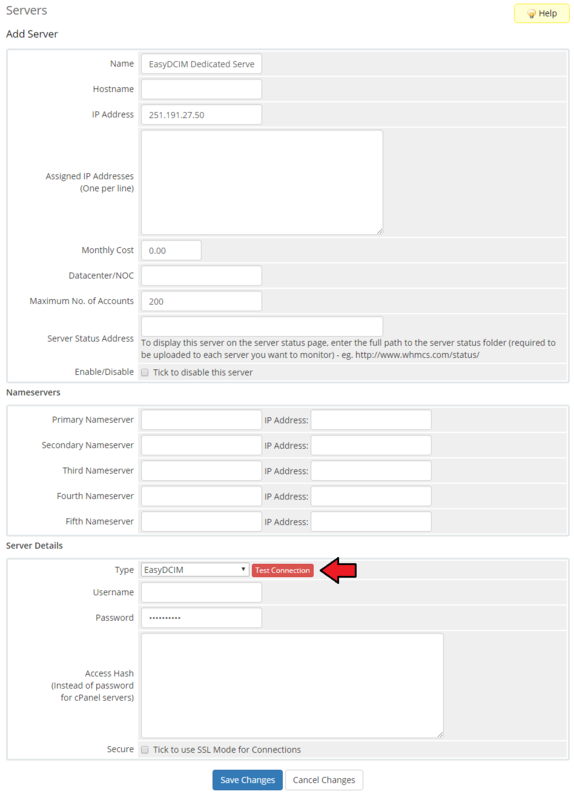 The 'Log In To Panel' button allows you to immediately log in to the client's EasyDCIM control panel. The 'Change Password' action alters the SSH access details to the client's server while 'Update Order Information' allows you to manually check if a server matching the one specified in the order has been found and assigned. 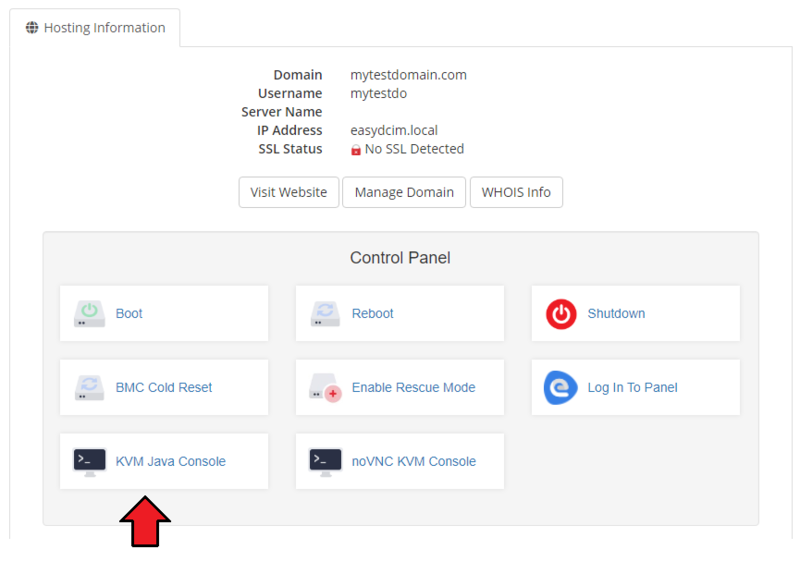 Our module allows you to boot/reboot/shutdown server, force BMC cold reset of the server as well as view its details. 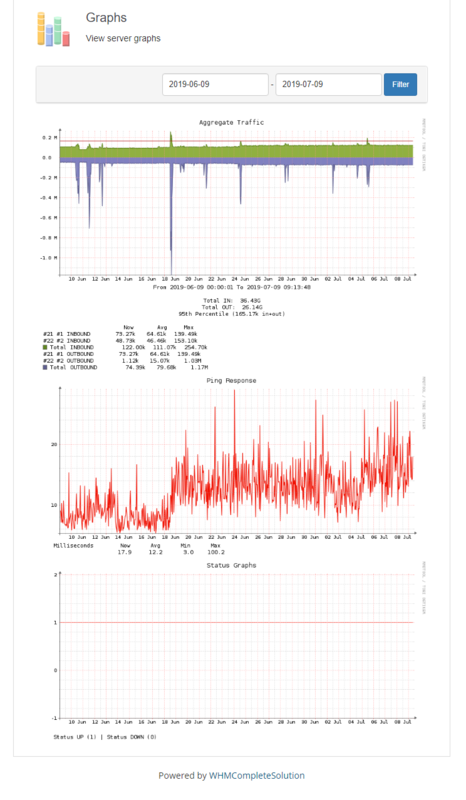 Below the mentioned functions, there are various usage graphs and statistics available at your disposal. Note: By default, there are 5 types of statistics displayed. If you need more, you can add them though the configuration.json file located in /yourWHMCS/modules/servers/EasyDCIM/Config. 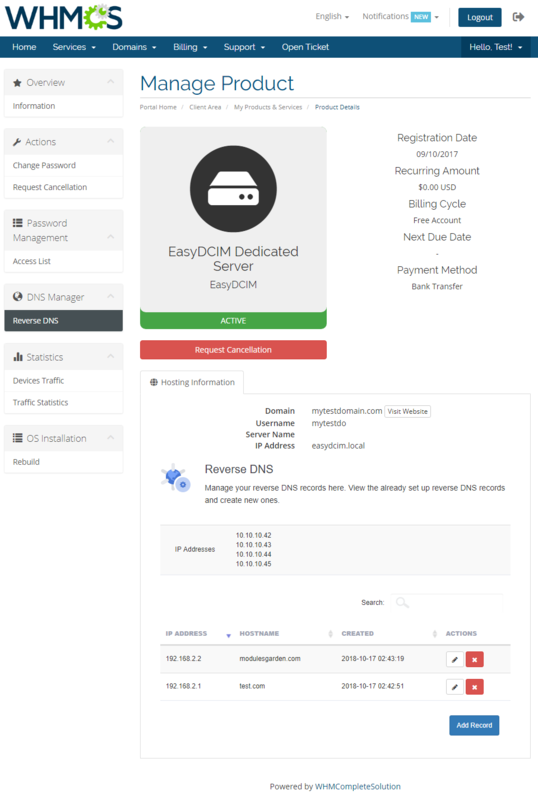 In the client area your customers can view all details concerning their servers, manage their status remotely as well as log in to their EasyDCIM control panel with a single click. Other available actions on the server: Boot, Reboot, Shutdown, BMC Cold reset. Additionally, they can explore several usage graphs. Move to Password Management section to see a full list of all stored passwords. Press the icon next to the password to show/hitde it. It is possible for your clients to control their reverse DNS. They can either edit the already existing records or create new ones. To create a record, all your clients need to do is fill in the necessary information. The newly created record will immediately appear on the list. Usage Collector section allows to view information about the traffic billing. 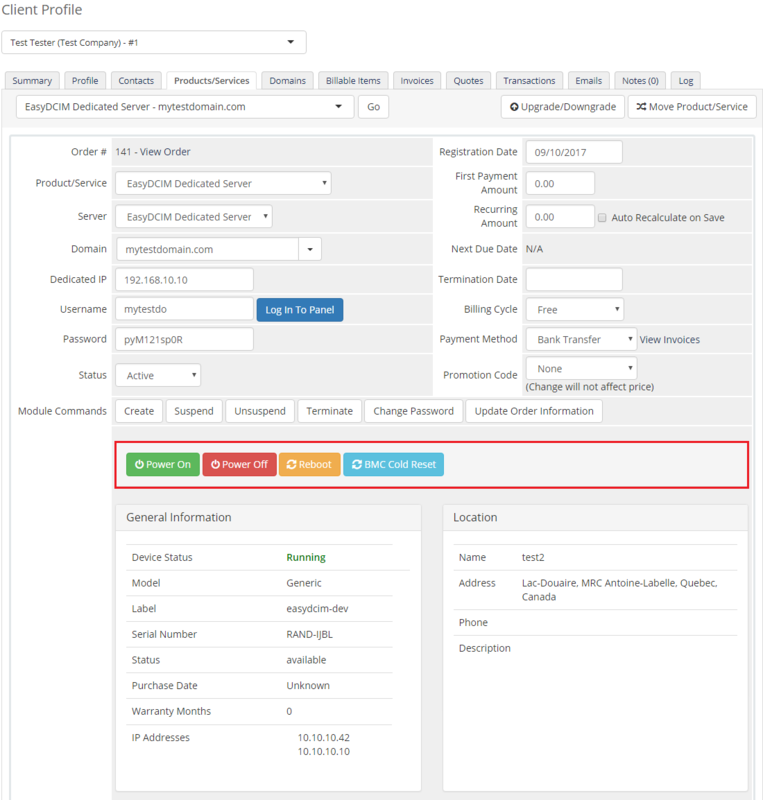 Note: Available time intervals depend on the date of the product registration. Finally, OS Installation sections gives the possibility to reinstall OS on the client's server. If your clients are using Dell or SuperMicro servers, they can access the KVM console. It will launch a Java applet that will automatically connect to your client's server. Note: The browser needs to have Java enabled with the correct permissions to make the console functioning. For clients using the 'American Megatrends', 'Dell', HP' and 'Supermicro' servers there is available access to the noVNC KVM console. 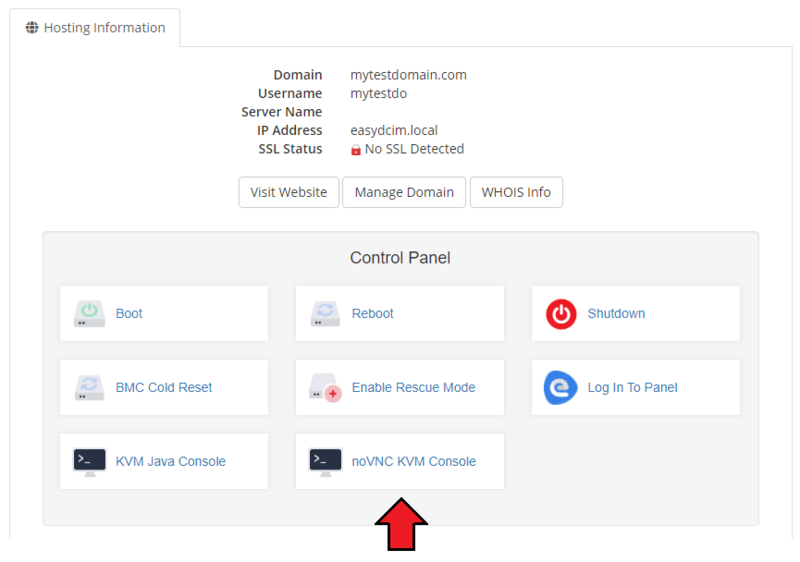 noVNC KVM Console in contrast to KVM Console is not downloaded directly on the client's device, EasyDCIM connects with proxy server via VNC to allow the remote session. 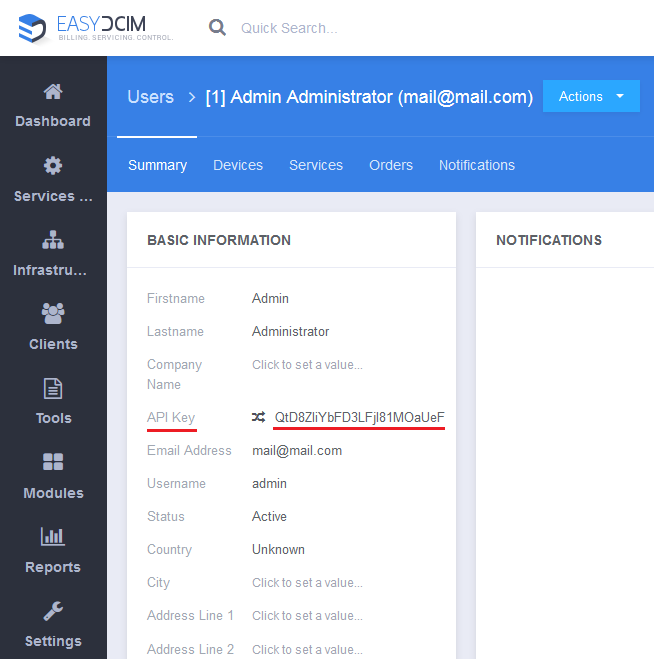 Whmcs Email Templates are compatible with EasyDCIM and you may easily include EasyDCIM data in their content. In this section you will earn how to create merge fields that then can be used in email templates that you send to your clients. A WHMCS variable with information on EasyDCIM matadata is ready to use! This allows you to charge your customers for total bandwidth and apply 95th percentile billing for additional traffic. In the first place the process aims at identifying the server matching the order 100%. When it fails, the server fulfilling the highest number of specifications will be assigned instead. 2. As this server supports the templates system, any changes made in the server's templates files will be saved after the upgrade process. 3. Since the 1.3.0 version, the 'monthlyTrafficLimit|Monthly Traffic Limit' configurable option has been changed to 'Bandwidth|Bandwidth' . Remember to change it manually after updating the module. This page was last modified on 5 March 2019, at 13:54.